There are two parts prievious to this, but if you all ready know about the World Bank and the American Dollar Bill they're not important. This part mentions many interesting facts I had known about before. When you have the time and feel up to it -- it can be depressing and unsettling -- I recommend it. It's a very important issue, and this video goes in deep. It's very motivational, and it's by Alex Jones so it's very American-centred but the issues still affects us all. Thanks for the link. I've been meaning to watch this as part of m warning post for the Speculative Visison forum, but I've been extremely lazy lately, prolly due to Christmas and all that... Anyway, It's good I don't have to download it to watch it for once. Good luck with that, Loxley. I think a lot of us have been lazy lately. No good. Alex Jones speaks with David Gergen about his involvement with Bohemian Grove; the central meeting place of all the world leaders where they carry out Satanic rituals and draw up plans for the New World Order. Gergen was a political consultant and presidential advisor during the Republican administrations of Nixon, Ford, and Reagan. What concerns me is that they may flag the net. IF that does happen, I will have to redo my entire forum. Argh...as so will so many out there who are sick of the lies and NWO schemes and plans. The sheep won't notice, but we who refuse to follow the crowd, it stirs inside of us. I’m sorry to say, and I sincerely apologize for any hurt or offence this may cause, but 9-11 was staged and performed by One World Order (which means that yes, it was partially an ‘inside job’), to trigger the War on Terror. Terrorism is a globally planned and practiced method for attacking the Human heart and mind and herding the fearful people like sheep into agreeing (or overlooking) things they’d never do otherwise. The Illuminati slogan is ‘Order Through Chaos’. It says that right on the building of their central temple. It says it right on the American Dollar Bill, under their symbol with the Eye of Set. They are using a fear of terrorism to turn us against each other, to allow us to be ID chipped, to have our rights and freedoms taken away, and to become in powerless under the system – which has been reengineered from the inside to suit the will of the One World Order. And by the way, the OWO are made up of two main groups – the Illuminati and a more-dangerous covert global Military group (not sure what their official name is) – and breaks down into numerous others; political leaders, corporate leaders, religious leaders, Mafia leaders, and others. They have Summit meetings where their leading representatives sit around a Round Table and discuss the Fascist future of our planet. Luckily, many Illuminati are not liking the One World Order, but unfortunately to leave or oppose it means their death. 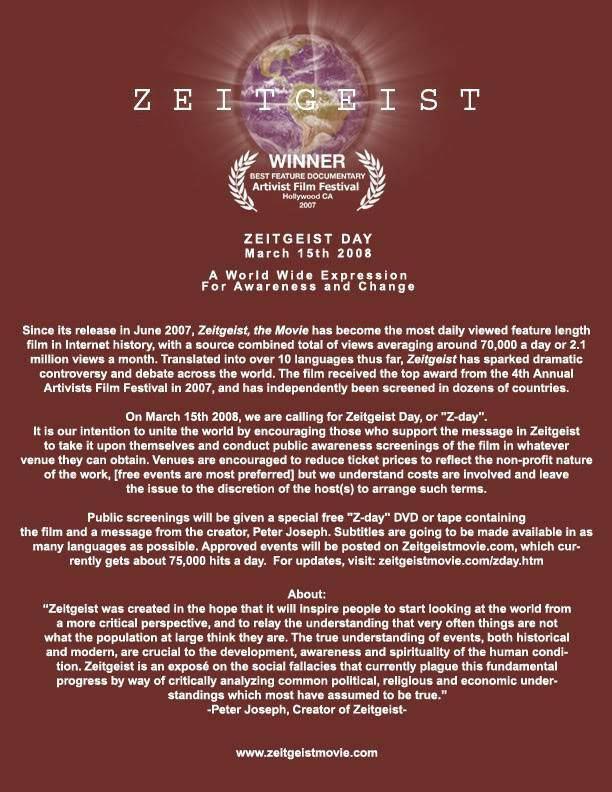 Yeah I saw Zeitgeist, it seems to be one of those films which most of the open-minded crowd love. It should be pointed out though that some of its points have been brought under much criticism. Supposedly it does assume some things and instead of going on fact; but I have not taken the time to research this for myself. I found it inspiring though. Epona that video is so profound. The world is a mess and we are being manipulated, have been manipulated for a very very long time.Thank you so much for sharing this with us!! I will get to the other videos posted in here when time allows. I did find this, which shows that people are becoming aware and passionate about stopping the Military Industrial Complex. As you might tell I am a fan of Alex Jones. He is one of the biggest, if not the biggest, prostesters and informers of what is developing in America. This issue of course affects all nations, as the OWO is a global organization. 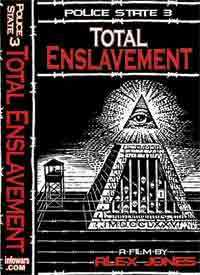 What is developing in the US is only a sample of what awaits worldwide if it doesn't stopped. That was a good page, TruthSeeker. I agree that the focus of a society should be on individual rights and freedoms, not on how to herd the public like packs of sheep. Sheeple is a term of disparagement, a portmanteau created by combining the words "sheep" and "people"; a reference to herd mentality. It is often used to denote persons who acquiesce to authority, and thus undermine their own human individuality. The implication of sheeple is that as a collective, people believe whatever they are told, especially if told so by authority figures, without processing it to be sure that it is an accurate representation of the real world around them. The term is generally used in a political or religious sense..
We use this word a lot, quite a lot.. I'm curious to know what the criticism was about. I really liked the first part about all the astrology. Sometimes I wonder about Alex Jones. I've also heard him compare David Icke to a turd in a punch bowl, but that might be true. There was something in these videos that rubbed me the wrong way about him. This is the beginning of a 5-part. He does not act too bad in the beginning. What do you guys think? The Rothschilds are one of the evil Thirteen Families of the Illuminati helping to organize the One World Order. This young ‘adventurer’ would have been initiated into the Illuminati at a very young age, and is undoubtedly very well programmed. See, this is one of the reasons why I am such a believer in Alex Jones, because he gets so many (if not all) of his facts so straight. He demonstrates time and time again that he knows the villains from the heroes. Jones has also spoken out about Michael Moore for playing the part of someone who pretends to be the voice of the people for issues like 9-11 when actuality he works for the Illuminati. He has presented good evidence to back this up, and he is not alone in feeling this way. As for his supposed comment on Icke, I have no idea. Many people consider Icke to be way off the deep end. I have found Icke very interesting, but what his real intentions are, I’m not sure. But as far as I can see Alex Jones is one of us. Here is an example of his take on Moore. It cuts out the part where Moore refuses to speak to him. Alex Jones said that about David Icke using legitimate conspiracy theories to support the "reptilian" theory. Alex said it was ridiculous and that he brought down the whole movement with his rubbish discrediting them with all his talk of "giant lizards." I'll try to find that video if it's still up. It was telling the story of David Icke. I agree with a lot of what Alex Jones says, but what do you think about how he dodges discussions about the Vatican? That's all very interesting. If you can find any articles or videos on these points I'd love to see them. The Vatican is an important issue. They're involved with the UFO cover-up, and of course they're a power house. What did you read disturbing about Mormons? I have heard that new Dan Brown book has some stuff about them too. Hmmm. I have a bad memory, let me see. I remember a supposed ex-vampire, ex-Satanist saying that Mormons were basically for helping people escape those things and re-establish themselves in society. But I have no idea about that. I recall hearing a couple of times in public forums I think about the Mormon Chruch being linked to the Church of Satan, but I have no evidence to consider it with. Basically I'm untrusting of all political powers anyway. I don't know a whole lot about them, but this Mormon girl got really mad at my friend and I for mentioning their secret underwear. Very funny! Must be to protect them from demons or something. I want to know what their secret is to their underwear.